In its 2016 Commodity Outlook published yesterday, the World Bank pays special attention to the impact of weak growth in emerging economies on commodity markets. The answer, unsurprisingly, is that a faster-than-expected slowdown in Brazil, Russia, India and China – especially if combined with financial stress — "could reduce commodity prices considerably" even after three years of sharp declines. According to the World Bank, BRIC growth is expected to pick up slightly to just above 4% this year, but this would be 0.6% lower than previously expected and significantly below historical average rates of expansion in excess of 8% recorded between 1990 and 2008. On top of that; "downside risks dominate" says the bank and many non-developed countries have become more susceptible to external shocks. Together the BRIC nations consume 40% of global energy and food commodities and over half of the world's metals. 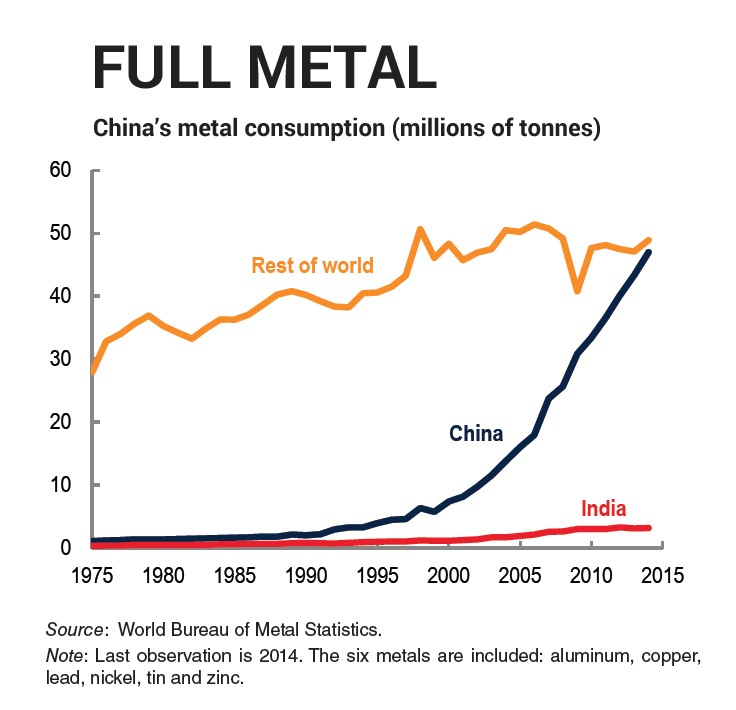 China alone accounted for virtually all the increase in metals (aluminum, copper, lead, nickel, tin and zinc) consumption of the BRICs since 1994. India's consumption of metals almost doubled over the past 20 years. But it's only taken the sub-continent's global share from 1.9% to 3.4% according to the report. 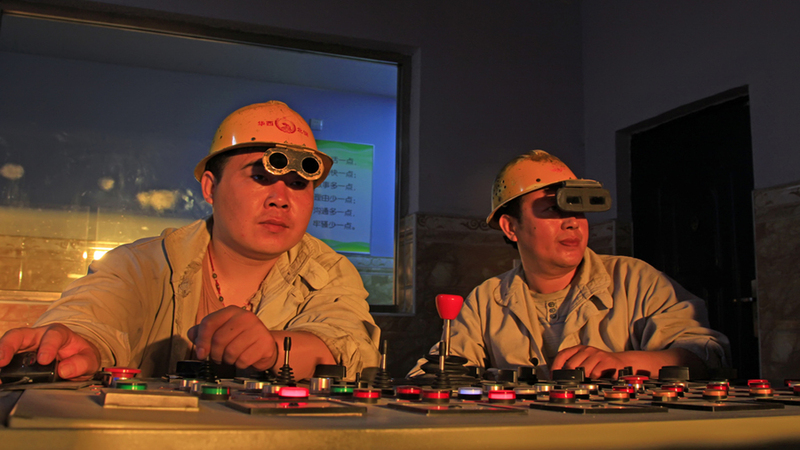 By contrast, China's share of worldwide metals consumption went from 6.4% in 1990 to 43.9% last year. This graph obscures the fact China's annual growth in metals consumption has slowed from 10.3% during 1995 – 2008 to 3.2% during 2010 – 2014 (just as well the bank's figures only go to 2014). But it makes it painfully obvious that the China-induced supercycle was unprecedented in size, scope and rapidness and is highly unlikely to be repeated. That's history. But the fall from these heights could be just as dizzying. 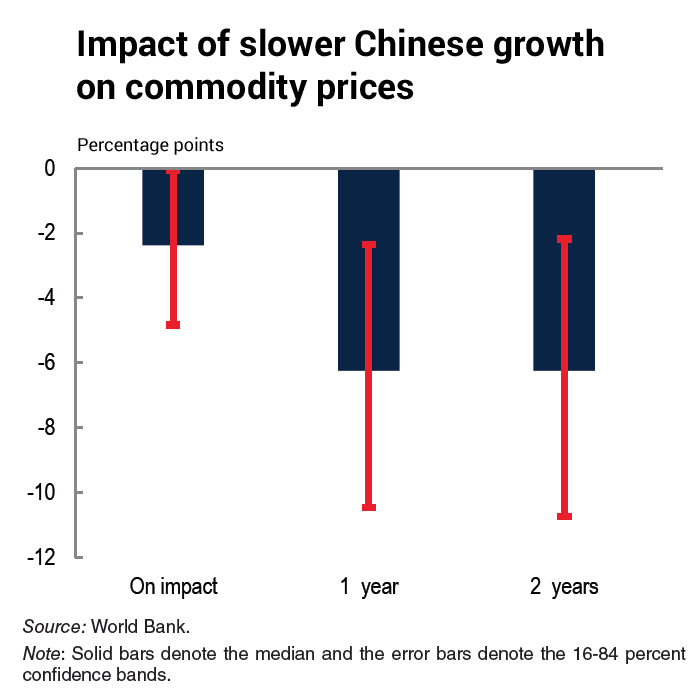 According to the World Bank a one percentage point drop in China’s growth rate could result in a decline in average commodity prices of about 6% after two years. However, the effect would “likely be more pronounced for industrial metals prices than for oil prices.” For example, while a 1% decline in China’s growth has been estimated to reduce oil prices by 1.1% – 1.9%, it could reduce metals prices by 1.3% to 5.5%. The World Bank's forecasts are some of the more pessimistic out there. According to the bank metals prices are projected to decline by 10% in 2016 while the iron ore price is expected to have another horrible year with declines of 25%. Nickel can fall another 16% this year following a 42% drop in 2015 while copper is forecast to fall 9% in 2016 according to the report.